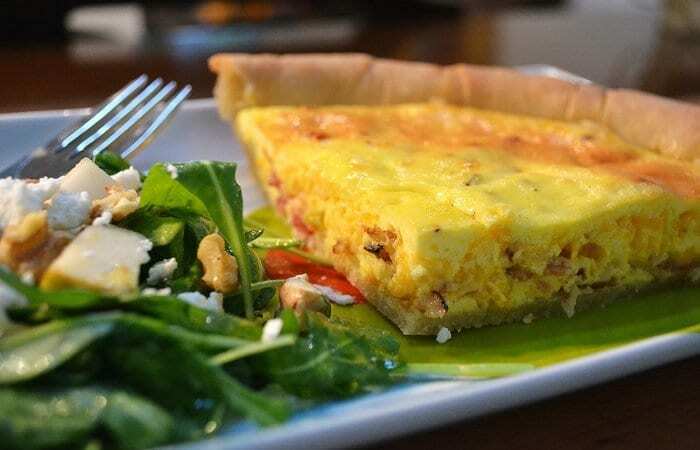 Serve with chopped walnut, pear and arugula salad with honey white balsamic vinaigrette- This was a surprise hit as egg pies or quiches do not necessarily elicit much excitement unless you are in your local coffee shop looking for something healthier than scones to go with your just-perked java. My youngest loved it so much she asked if she could have it for breakfast the next day. Because this is such an easy recipe to make with most of the time invested in waiting for it to bake, we whipped up another quiche, baked it, and cooled it all before her bedtime. My oldest daughter, who typically does not care for eggs, loved it, but was especially keen on the chopped walnut, pear and arugula salad, going back for seconds. The whole meal is a keeper! Spread unthawed crust with butter. Sprinkle bacon, onion and cheese on bottom crust. Whisk the eggs lightly with the sour cream. Whisk in the 1/2 teaspoon sea salt and 1/4 teaspoon ground black pepper. Carefully pour egg mixture over the ingredients in the crust. Bake for 15 minutes. Remove the quiche and cover exposed crust with tin foil. Turn down to 325 degrees and bake 40 more minutes. Let stand 10 minutes. Serve with salad. Prepare the salad while the quiche bakes: Toast the walnuts in a dry skillet over medium heat. Remove, cool and chop into bite sized pieces. Set aside. Place the arugula in a large salad bowl and top with the toasted walnuts, pear slices and goat cheese. In a small jar or bowl whisk together the balsamic vinegar and the remaining ingredients. Toss salad with the dressing just prior to serving or serve dressing on the side for each person to use individually. *Trader Joe’s has uncured, no nitrate, fully cooked bacon which is a saviour in this recipe. I just chop up the precooked bacon, saving me time and mess of cooking the bacon ahead of time. **This is one of my favourite vinegars that I buy from Joe and Son’s Olive Oil Co. in Tampa. To make similar vinegar, combine 2 tablespoons of white balsamic vinegar, ½ teaspoon fresh ginger or 1 teaspoon ground ginger, and ½ tablespoon honey. Or you can just use an apple cider vinegar in its place, especially if you or your family are adverse to ginger. Add in vegetables or eliminate the bacon altogether for a vegetarian version. Swiss cheese would also be a classic cheese to combine with the bacon and egg.